Tobias gets a beer. 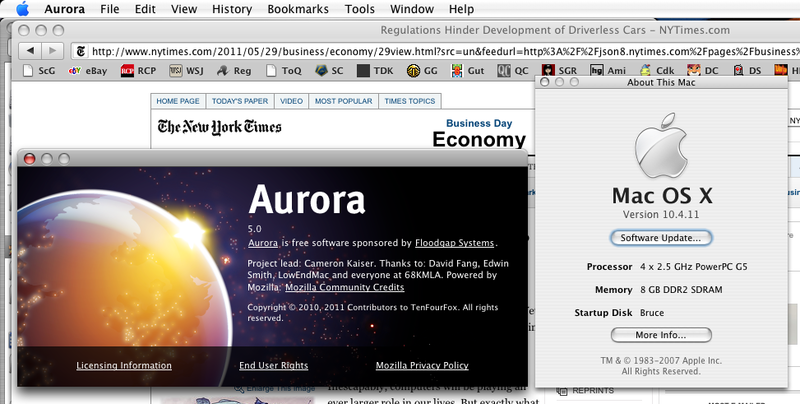 This is the G5 build of the Firefox 5 beta, although for some reason it says Aurora. This was built with his 10.4-linked 64-bit ld, and appears to have all of our standard features. And it works! Unfortunately this is not shippable either, as it is still building that monstrous 750MB+ libxul, so we're going to need to find some way of stripping that library down. Fixed! Good ol' strip -x seems to have done the trick, and I will fix the build system to reenable stripping which was disabled for purposes of linker testing. Doing some more testing before issuing a formal beta. Meanwhile, I am considering options for 4.0.3. Let's just come out and say it: after a number of sleepless days struggling with it, it does not look like there will be a "TenFourFox 5." Before you panic, that does not mean that TenFourFox will be unsupported or will not get new features! It just means we won't be building from the post-Mozilla 2.0 codebase anymore, and there is a bright silver lining to it. Before we do that, let's post-mortem Firefox 5 on 10.4.11 PPC first. This is nerdy, so if you just want to skip on to the new revised roadmap, go for it. As explained in previous entries, my main concern was that Mozilla as of Mozilla 5.0 requires Chromium IPC to be built (IPC is now required), and IPC requires building a giant library called libxul. In Mozilla 2.0/Firefox 4.0, this was optional, and we built without them because Chromium IPC requires lots of 10.5-only OS functions and libxul was too big to link with the Tiger 32-bit linker. It is possible to get Chromium IPC to compile "just enough" to make Mozilla's IPC happy, because Mozilla's IPC code does not use very much of Chromium at all. Chromium includes lots of system abstraction code, which Mozilla doesn't need because it uses NSPR, and as a result almost all of the stuff that didn't build can be safely stubbed out with empty functions. The exception is the launch code, which requires posix_spawn and friends (which 10.4 doesn't have either), but even that right now is only used by out-of-process plugins which were marked for death in "10.4Fx 5" anyway. It would be a problem when Mozilla goes to full one-process-per-tab, but that is not imminent, and we can work around that too. So that much is doable, and does compile. Linking, however, turned out to be hugely troublesome. Tiger has two linkers, the regular Darwin /usr/bin/ld which is full-featured but only 32-bit, and the 64-bit /usr/bin/ld64 which can deal with larger files but lacks many important features. In particular, a number of the indirect linking features Mozilla requires for dylibs are not supported in ld64, though they do give just warnings instead of errors. The reason this is important is that the linker can only deal with libraries that fit within its addressing space, and even with optimization and stripping libxul is too big to fit in 32-bit space. The first problem was Apple's libtool: it doesn't let you choose your linker. To get around this, I wrote a shim Perl script to act as a switchable ld, calling ld32 (the renamed original /usr/bin/ld) ordinarily except if LD64 is set to one in the environment. I then hacked the Python build argument generators to call another Perl shim that looks to see if libxul is being linked or linked against, and turn on 64-bit linking if so. That much works. The next problem, however, was that debug libxul can't be linked even by the 64-bit Tiger linker: it crashes with a malloc() error, strongly suggesting this is an operating system limitation. The size of this library, by the way, approaches 750 megabytes and I'm not even exaggerating. Since I doubt Mozilla would distribute an app that large :), something is already wrong. But that wasn't all. For G4 and G5 optimized builds, the WebM accelerator assembly code requires special linker settings and ld64 doesn't support them either, so they couldn't be built as is. (ld32 couldn't even start, by the way.) Losing this code would be a serious blow to us, but would be doable if we could get the basic browser at least to stand up. Unfortunately, we couldn't. The G3 version did, finally, appear to link in ld64 with a crapload of warnings, but when I started it up in the debugger it crashed immediately in darwin_gcc3_preregister_frame_info. This is a very low-level symbol in the C runtime (crt1.o) and suggests that dyld could not resolve the links. This could be for any number of reasons, including the app has to be in 64-bit mode for dyld to resolve references in a library of that size in 10.4 (a show-stopper), dyld can't handle a library of that size at all in 10.4 (also a show-stopper), the linker actually did fail and didn't realize it (also a show-stopper), or I munged the code while making it acceptable to the compiler to such an extent that it can't enter its main loop (and since we can't build the debug libxul, we have no good way of debugging it). It could even be all of the above. Mind you, I'm not totally admitting defeat, but I am pretty confident now that we cannot build Firefox 5 as written on 10.4.11 PPC, at least not with our current tools. It should be possible to build it on 10.5.8 PPC, and there are some early builds on El Furbe of 4.2 (which was 5's original version number), but I don't know how well these work and his buildbot seems to have stopped again. That doesn't help us, though, because we support G3 Macs and 10.4, and we always will. More to the point, I personally only run 10.4 and can't support a "TenFiveFox." If someone out there wants to apply the TenFourFox enhancements and run off 10.5-only builds, I will gladly direct people their way, but here we stay on 10.4. Make sure your system is set up to build the current TenFourFox as a prerequisite (see the wiki) and that it can, in fact, build TenFourFox 4.0. Download the current set of Firefox 5 patches and serially, in numerical order, hg import them into the repo. Move your /usr/bin/ld to /usr/bin/ld32, and move SHIM.ld in the repo root to /usr/bin/ld (you need to do this as root, obviously). You don't need to undo this at the end unless you want to as it is designed to be transparent. Replace this with your custom linkers as indicated, of course. Build as instructed in the wiki. Good luck. Post your experiences. Welcome back, non-techies, now to the roadmap. When Firefox 5 comes out, it will move to mozilla-release, and then in 6 weeks be obliterated -- no more numerical branches. At that point, assuming no one has cracked the problem we discussed above, we drop source parity and continue our development purely from Mozilla 2.0 at feature parity state. First, let's discuss what this means practically. Camino is very popular with PowerPC users, and 2.0 is based on Firefox 3.0 (Mozilla 1.9), which is three full generations behind TenFourFox. Despite this, it still manages to get the job done for a great many things; I myself am a former Camino user. Even Camino 2.1 will "only" be based on Firefox 3.6 (1.9.2). So even if we just phoned it in and did only security updates, functionally speaking TenFourFox would still be generationally ahead for several years. Remember how long WaMCom usefully persisted on OS 9 with nobody at all updating it? And, since we aren't moving to TenFourFox 5, updates will still function properly in the way they are, and the plugin code won't change. So you get to keep plugins after all. I hope you're happy. ;) My arguments over security still stand, however, and I still strongly recommend something like Flashblock. 4.0.3 is the next feature release. This will turn on the nanojit for the browser chrome and hopefully add load-store to the nanojit (these were features intended for TenFourFox 5 originally), along with configurable WebM filtering settings. It will also include security fixes and Firefox 5 bug fixes that we can safely backport. It may or may not include some new safe-looking features that do not significantly change the browser, such as the Firefox 5 changes and enhancements to HTTP and XMLHttpRequest. I might defer these to a '4.0.4'. 4.1 is where the magic will start. Among the features I think we need to have include Firefox 5's improvements to canvas, CSS animation, WebSockets (when they finish screwing around with the IETF spec, likely by Firefox 6) and SSL False Start. These are all features likely to be leveraged by future sites. Similarly, we should try to adopt some of their SSE/NEON vectorized improvements, especially for text scanning, along with libjpeg-turbo. These features are developing and we need to constantly watch for new bugs, so we should keep this set of new supported web features small and essential. If 4.1 is delayed, there will be a 4.0.4. Because 4.1 changes the browser core in significant ways, we should not report ourselves as Firefox 4 anymore. We might adopt a built-in user agent changer like Classilla. More on that later. So, the road moves on, just in a different direction. I'm going to start writing up new roadmaps and worklists in the meantime while 4.0.2 builds on the G5. And for the hacker builders, you've got eight weeks or so of Firefox 5 to see if you can get it running and succeed where I failed. In the meantime, TenFourFox remains "four-ever, yours." 4.0.2pre "beta" is now available for testing. The only TenFourFox specific change is issue 58, suggested by chtrusch for those systems that don't react well to plugins forcing smooth scrolling; you can now set tenfourfox.layout.smooth_scroll_plugins to false if you don't want that to happen. Speaking of plugin prefs, there are now separate prefs for full-page and embedded plugins, and actually now would be a good time to open about:config and type tenfourfox in the filter box to see all the custom prefs that are available presently. There will be more in the future. The compiler changes we were hoping to take advantage of unfortunately made the browser dreadfully unstable -- it couldn't even open a window. We will not mess around with the compiler again until we must use gcc 4.2. As mentioned previously, there will be no official Firefox 4.0.2 -- TenFourFox 4.0.2 is the same as Firefox 4.0.1, with security patches I have reviewed and applied while we wait for Firefox 5 to enter the beta channel and I can investigate if I can port it. This is part of our commitment to maintain a secure browser regardless of what actual version of Mozilla/Gecko we are using. There should be no compatibility issues. You can see the security issues applied (please note that some will require security privileges to view) by reading the rough draft of the release notes. On final release, these will be in the maintenance changesets, minus test cases so that we don't leak proof-of-concepts for any bugs that are still sec-locked. The patches in question were already approved for Firefox 5 and we are simply backporting them to Firefox 4. Firefox 5 goes to beta channel tomorrow and I plan to pull source and do some preliminary work on it in between moving into my new house. For now, please try 4.0.2pre. UPDATE 5/17: See comments; a crash bug has been isolated and repaired. Stand by for a rebuild tonight or tomorrow. If there are no issues, it will be converted into final release on June 1st. Well, this was unexpected. Multiple places across Bugzilla with 4.0-ready patches are now being denied to land on mozilla-2.0, and the reason appears to be that there will not be a Firefox 4.0.2. Instead, Mozilla is dropping Firefox 4 after 4.0.1 and going straight to Firefox 5. In fact, Firefox 3.6 will be supported longer than 4.0 will! That was the bad news, now for the good news. My request to receive Mozilla security group privileges was accepted, and I am now able to view security issues as they are submitted and as they develop. Using this new access, I've been able to identify some security and stability fixes that apply to 4.0.1 (and some to 3.6, but there will be a 3.6.18 for those of you who are still unsure about jumping to TenFourFox) and that can be accepted by us safely, to keep us at security parity while I ponder what to do with Firefox 5 as it enters the beta channel. - Each branch will have a base set of patches specific to that branch. In the case of Firefox 4.0.1, it is the changeset that is already available and that you can download now. These sets are the "base" and are the unique TenFourFox portions the browser is built upon. They should be unique to that branch and should not carry future work unless absolutely necessary, i.e., no changesets that would be part of a future Firefox branch. The reason for this is that the base will be carried forward to the next release of Firefox and modified as needed, so we don't want changesets that would already be in that release (most importantly stability and security fixes we backported from the future branch). The base may be added to if we find TenFourFox-specific bugs that we need to repair in point releases. - On top of that will come specific future changesets that we are backporting for stability or security. There are ten of these I am reviewing for probable inclusion in TenFourFox 4.0.2, and about six others of low severity that we may or may not take. None of these are highly critical, but we should fix them. These changests are already in Firefox 5; we do not want to carry them forward in the base. These changesets will be maintained separately and will not be reapplied to "mozilla-5.0" or whatever they're going to call it because they don't need to be. The version and milestone should be maintained here too because we definitely don't want to have to merge that in base. So, for 4.0.2, new base changes will be the compiler string modifications and UPDATE: the compiler changes make the app really unstable, so we're not shipping them for 4.0.2 the pref for enabling or disabling smooth scroll with plugins. We will then establish a maintenance changeset with the new version and milestone numbers and the security/stability patches, which I'll document in the release notes. Builders need to apply both the base and the maintenance changesets to generate a complete version. When Firefox 5 comes out of beta, then we'll immediately clone that repo and apply the Firefox 4 base to it, making any additional changes that we will need and thus creating a new base for that release branch (assuming it works, of course -- see the previous entry for why this is probable but not guaranteed). Assuming a TenFourFox 5, while we wait for Firefox 6, we will watch for security updates and backport to 5.0.1 as necessary. I have not yet decided if there will be a 4.0.3. If there are no major issues by the time TenFourFox 5 dawns and it seems to work, then we will simply release. If there are some issues identified of sufficient severity that do still affect us, I will issue a 4.0.3 for those who can't give up plugins just yet so that it can buy them some time. The current plan is to select and land patches this week and chug out builds over the weekend for you, the loyal beta audience. 4.0.2pre should be available on Monday, and if there are no major issues 4.0.2 final will come out on June 1st. As always, comments and questions solicited.